Hello everyone, and welcome to Leisure Lane. I hope you are all well and enjoying lovely days. I will admit that lately I have been feeling quite empty, much like the little stocking in this Christmas tale, until I noticed a recent heart-felt review that filled me with hope and happiness – the hope and happiness that comes with imagining how this story could have the opportunity to inspire others in a wonderful and positive way; and that makes me very grateful. The review is as follows: [WOW!] I did not expect such a moving tale.. My heart was so moved by this small tale that I wish to make it a skit/ play at my church. I will share this story over and over. Great insite of a Christmas stocking. You can check out this review and others here. Happy day, everyone and welcome to Leisure Lane. My sister has loved purple since she was a child, and to this day her passion for the exquisite color is still going strong. For me, on the other hand, it was simply another pretty color. But, the older I get the more attracted I am to its subtle, yet bold invitation to succumb to its beauty – to allow it to adorn my soul with its strong, yet calm demeanor. It’s truly a color one can lean on as the years progress – it compliments nearly every skin tone, perks up or quiets any room in the home (depending on the shade), and is just plain delightful in every way. My mother loved its lavender shade, and it loved her, as well. When I found the beautifully shaped silver butter tray (above) in my local thrift store, I knew it would make a perfect vanity or dresser tray. 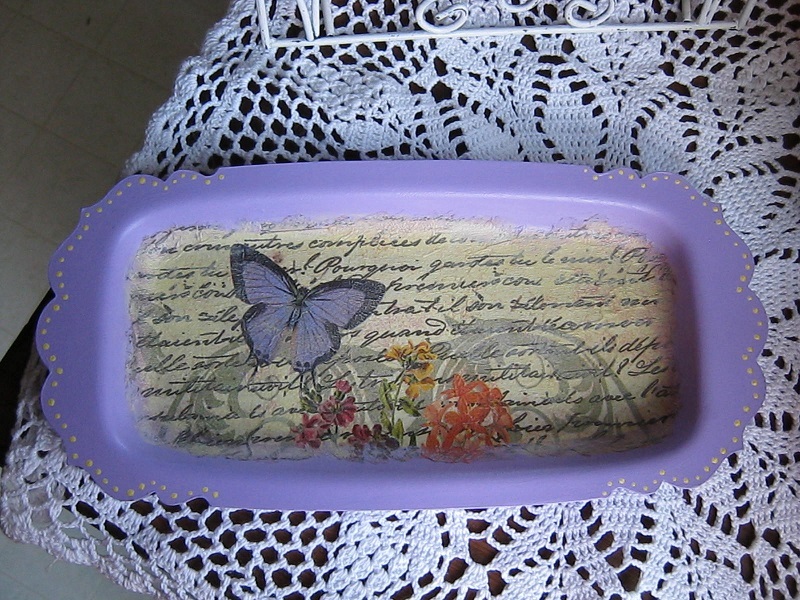 I painted it a lovely purple shade, adding its yellow companion as dots along the edges. Then I decoupaged a complimentary napkin along the bottom. Perfectly pretty, and hard to part with, but it sold in no time and now brightens the days of someone else, and that make me smile. Hello everyone. Welcome to Leisure Lane. I hope your new year is starting out healthy and happy. At 5 o’clock p.m. on New Year’s day, I was sitting in the living room in the quiet, as the last glow of sunlight poured through the window onto the fireplace mantle. 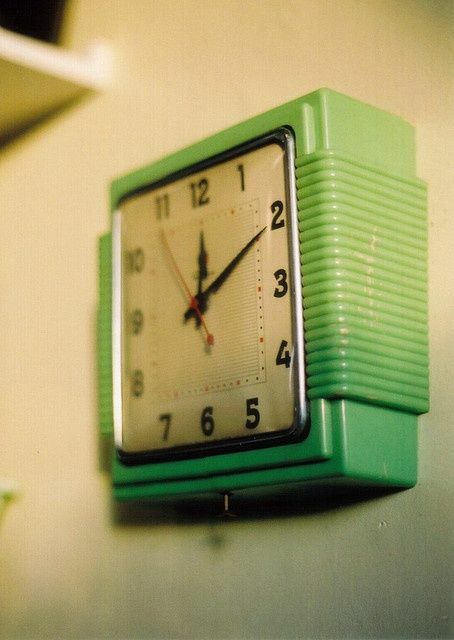 Of course, that brought back nostalgic remembrances of my younger days in my mother’s home, and I thought of her kitchen clock – the timely sentinel that watched over our family and tracked the minutes of our lives. A poem instantly ensued. I share it here, hoping it will also inspire you. Our clock was a soft white. But I remember that red second hand turning and turning. Telling what only time can tell. But for her smile would surely tarry. A homemade snack to hail the season. Our father soon would come. Pots full of double messes. Their favorite show would start. And laughter from the heart. Of that we’d never tire. Hoped we’d wake to morning snow. To let us know our school is closed. We’d pray with child-like powers. All through the dark of night. It never lost its sight. That comes with morning dew. Are the first of many tasks. Wash off their sleepy masks. It’s time for school, it didn’t snow. As we’d sit in our own seat. On the fireplace all abloom. In days that once were alive. Could be counted by its dials. No one knew the mystery of the Father. No one knew the mystery of Love. No one knew the mystery of Sorrow. That mystery of Triumph with a holy kiss. No one knew the mystery of Jesus. That mystery of perfect harmony. Now the time for mysteries is over. For nothing hidden will not be revealed. I hope that this song inspired you today to live a resurrected life of joy, well-being and love. 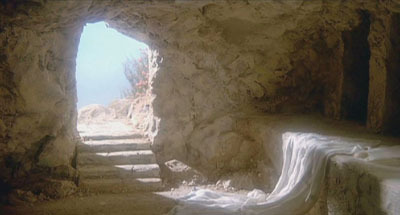 Happy Easter to everyone, may God bless you all, and until next time…may happy days abound!